After Terminator 2: Judgment Day was made 12 years ago , Arnold Schwarzenegger said he would not do another Terminator movie unless the script was good. Usually, that's a Hollywood euphemism for, "they'd have to pay me a LOT of money" (see Mel Gibson Lethal Weapon). But with Arnie, you know he doesn't need the money. Plus throughout his career, he hasn't done many sequels. Out of nearly 40 movies, he has done two Conan movies and two Terminator movies before Terminator 3. No matter what I think of him on a personal level, I respect his choices as an actor even if a lot of his movies aren't very good. He just seems like he's having fun, not totally into it for the money (see Sly Stallone and 15 Rockys). So I can imagine when Arnie read this script, he loved it. And with good reason. So my recommendation? RUN.... do not walk to see Terminator 3!! WOW. I was really impressed. True, it's a sci-fi action film, lots of great action, but it also has a great story. I was hoping it wasn't another "Terminator from the future goes back to kill John Connor.... again". Nope. This story was something more, a lot more. It's a sci-fi movie that makes you think and I haven't seen one of those in a long time. They not only updated the elements of the movie with the new and improved Terminator (the woman TX), but they also updated the story. I'm always leery about one writer/director messing with the previous writer/director's movie and ruining what went before. But that didn't happen here. If anything, they made the story BETTER. They changed a few things, but IMO, they didn't undermine or negate T1-T2. They just put a different spin on them that made total sense. For instance, there have been some complaints that the ending of T3 was fatalistic. I agree that it was fatalistic, but I didn't think it was depressing. The message of the movie is that Judgement Day will still happen and nothing humans can do can stop it. But it also sent the message that humans are fated to stop the machines even if Judgement Day does happens. Hence the survival of John Connor yet again. In other words, humans created machines, humans can destroy them. However, the idea that Judgement Day can be stopped is an overly idealistic one. John Connor originally sent a message to his mother, Sarah Connor, via Reese in Terminator 1. Essentially, he said that "our fate is what we make" and Sarah set out to change humankind's fate by destroying Cyberdyne's lab in Terminator 2. John Connor from the future believed that our fate could be changed, but is it really so? He was coming from a future where the machines did take over the earth and blow up the world. So could Judgement Day really have been prevented? In T2, Sarah and little John thought they could change the fate of the world, but maybe they couldn't. According to T3, Sarah hung on for 3 years after being diagnosed with leukemia because she was still nervous that they hadn't changed their fate. John Connor dropped off the radar because he was afraid of being tracked again. So obviously, there was some doubt on both their parts that the fate of the world had not really changed. As I said, the end of T3 was fatalistic but it didn't leave me feeling depressed. Some things just can't be prevented because by the time we realise what's happening, it's too late. IOW, the inevitability of Skynet taking over the planet may have started when the first computer was made in 1943. Can any human being really stop it from happening, 60 years down the road? Probably not. Skynet overtook the humans by executing a computer programme disguised as a virus. It was really easy to corrupt our computer systems since we already have the worldwide network in place (I thought that was a brilliant idea, btw). So when Kate Brewster's father steered her and John into the fallout shelter, that's pretty much what he was saying. It's a done deal. No way to stop the machines. This time. In general, I don't believe in Fate in everything we do. But in some big cases, there isn't much we can do to change it once the ball starts rolling. For instance, I believe we humans will destroy ourselves at the rate we're going. This is our "Fate". It all started when we created the first machines that will do the work for us on a massive scale i.e. the Industrial Revolution. (It's ironic that the collaboration of machines and humans in real life is as destructive as it was in T3). Anyway, since that time in the 1800's, the population has exponentially skyrocketed and there's no turning back now. Check out the graphic on the population rate for the history of humans, it's downright scary http://pieria.acs.southwestern.edu/econ/worldpop/sld016.htm. However, in each of our individual lives, I believe we can change our Fate every day by the choices we make. IOW, there's the Big Fate and our own little individual fates. Anyway, that's what I got out of the ending. It's fatalistic but it also makes sense as a natural course of events. 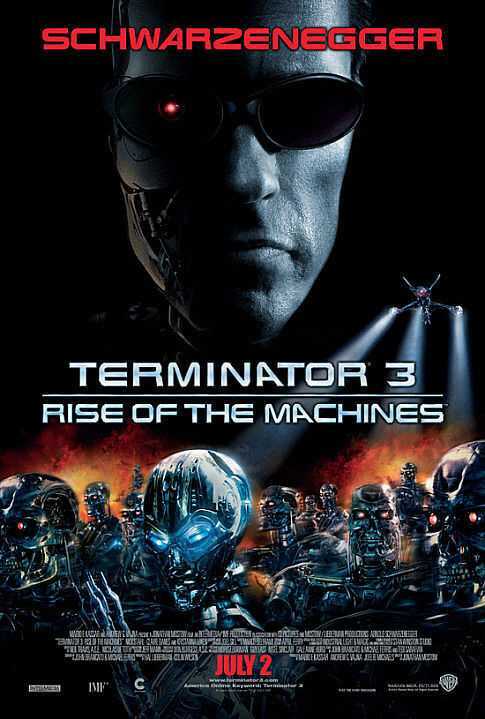 I imagine that the T4 movie will be about how John Connor rallies the resistance and shuts down Skynet. Humans are destined to eventually kill the machines. I have avoided Matrix Reloaded and Hulk because of what I've heard. A lot of movies these days seem to be imitating video games. A lot of special effects with little or weak story, as if people will be distracted enough by the special effects they won't notice there's no story. But T3 had it ALL. Special effects, lots of action, character development AND a story. I was thrilled! I have to see this movie again!! Nick Stahl (John Connor) and Claire Danes (Kate Brewster) did a fine job as the two leads. Arnie was well, Arnie. My only niggling thing was I didn't think Kristanna Loken (the TX woman) was all that impressive, but my friends who went with me thought she was great, so what do I know? Oh, and the ending left plenty of room for a sequel. It wasn't gratuitous though. If they do a T4, which I think they will, it will fit in naturally with where they left off in T3, although it's not a cliffhanger either. Xena related note: early in the movie, there was a cat named Hercules in the animal clinic where Kate worked. They mentioned the name twice so I'm assuming it was intentional and the director and/or writer is a fan. Then later in the movie, one of the trucks that gets in the way during a chase scene has "Xenadrine" in big bold letters across the side of the 18 wheeler. The name was emblazened across the screen for a good 10 minutes. "Xenadrine" is an over-the-counter muscle enhancer, but I think it was more the name that the director was pointing out. Hello Xena and Hercules! If you don't like sci-fi action films, I can't help you there. But if you do and you only see one film this summer, see this one.